Ladies and gentlemen, welcome back to the PhoneArena Awards of 2011! Today, we are here to announce the best product design of the year, and boy do we have a lot of candidates to grab the prestigious title. However, there can be only one winner in this category, but since we are good in heart, the second and third best devices will also get some attention. What we are mainly focusing on today is the way a product looks, but the way it feels when being used is also of great priority. Besides, premium materials are, of course, a plus. But before we start, allow us to remind you that we have already given six other awards over the past several days, so in case you have missed them, feel free to check them out. Anyone who has ever had the pleasure to hold the Motorola DROID RAZR knows exactly why we give it our best product design award. First of all, the RAZR is almost impossibly thin. It currently holds the title of thinnest smartphone on the market, for that matter, despite the fact that it boasts some cutting-edge hardware. Second, how often do you see a smartphone built out of stainless steel and Kevlar? The premium materials that have been used in its construction ensure its rigidity, so you know that the Motorola DROID RAZR will withstand the tests of time. If we had to describe the Sony Ericsson Xperia ray with a single word, that would be “adorable”. The smartphone is thin, light, and incredibly comfortable for single-handed use. On top of that, it has enough charm to grab the attention of the design-conscious audience, and Sony Ericsson didn't miss the chance to use the power of marketing to bring that up. The Nokia N9 may be one of the outsiders on the smartphone scene, but when it comes to design, it surely scores two thumbs up with its minimalistic and elegant looks. For it has something that most of the smartphone heavyweights lack – personality. Touching the curved glass on its display is a celebration for your fingers, and the sloped sides make the device lay naturally in your palm. With its high-grade colored plastic casing, the Nokia N9 feels fresh, modern, and simply cute. So, there you go, folks! The Motorola DROID RAZR scores the best product design award, followed by the Sony Ericsson Xperia ray and the Nokia N9. 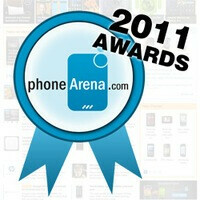 But the PhoneArena Awards of 2011 are far from over yet! Stay tuned, as the next category will be announced no later than Monday. Since iPhone 4s looks same as iPhone 4. They won't put it as a winner in this contest. Quite obvious rly. I disagree with this article, I think the RAZR is ugly as sin and way too thin and flat. It's like a rectangular pancake. If the iPhone was a 4" screen I would say it should be in the Top 3. SGS2 in white needs to be in Top 3 as well. I do like the N9. I bet the Nexus would be up there if it was white. And seriously, not a single HTC phone? I don't like HTC phones but visually they look good. Build quality is junk though. i thought you gonna give it to iphone since in every reveiw you guys say that iphone is better in design. LMAO! Thats a good one. They put the N9 which is the same but 15% bigger. you are right but still its a different phone. My Sony Ericsson Neo or Arc is better slimmer and is amazing at looks than that of Sony Xperia Ray!! Who the F**k writes this blog!!??? I'm seriously pissed off with this writer. I agree with you, The Xperia Arc S white version or the Original Xperia arc Misty Silver is the sexiest by any means in the smartphone world. If you compare the Arc to these three mentioned side by side, they would absolutely sucked! While it was a single person who wrote the article, it was the team of editors who chose the winner in the category, as well as the runner-ups. This is nothing more than PhoneArena's pick, and if you believe that a different device should have won the best design title, that is absolutely fine. No need for obscenities or an excessive use of punctuation marks. And Nokia N9 or Nokia 800 deserves 1st place than that of stupid RaZR phone....! The n9 should have been second at least if not first. Nokia N9 is the best looking. Especially in black version. YAHOO!!! MY phone won!! LOL, like I actually get some sort of monetary or personal gain from it. Yeah, the design is nice - thin phone, but no pull out battery, well with a little work that can change. Everybody acts like because they buy a phone that they now own that company and that company cares about them. Buy a phone and be happy with your choice. it also looks like every other HTC on the planet, hense it doesnt stick out.